CLiKZiN must be applied with a manual or automatic dosing gun (e.g. Novartis Pour-on gun), with a spray nozzle, which guarantees the correct spreading of the product on the fleece. Best results will be achieved by holding the gun approximately 45cm from the sheep during application. Apply as a fan spray along the spine of the animal in a band at least 10cm wide from the middle of the shoulders and in an arc around the crutch and tail (see diagram on label). Half the dose should be applied along the spine with the remainder over the tail and crutch area. CLiKZiN is administered once, before or at the beginning of predicted Lucillia fly activity, but is is also suitable for use during the fly season. 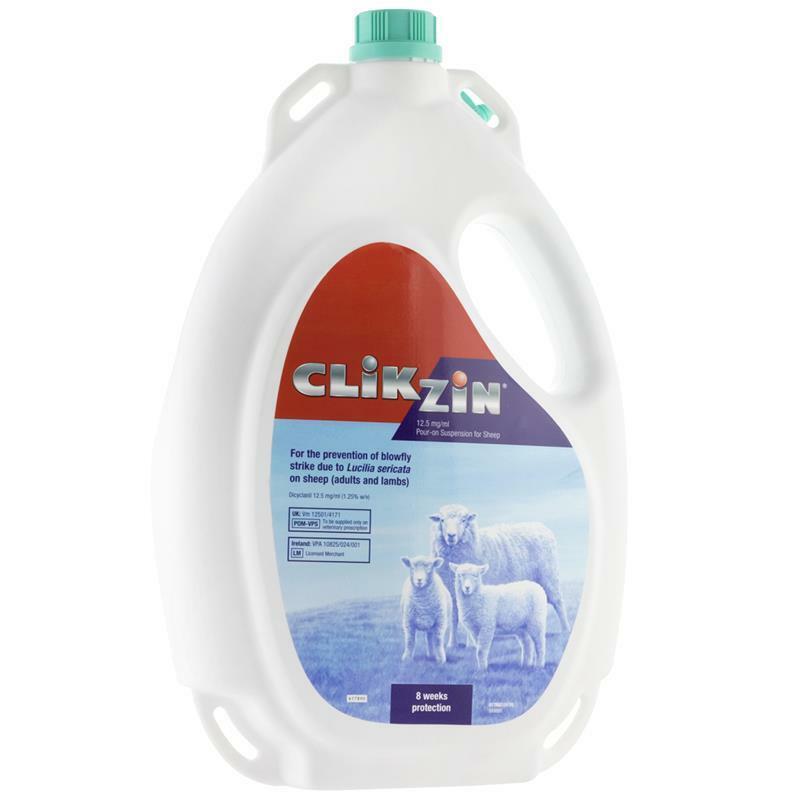 CLiKZiN will protect against blowfly strike caused by Lucillia flies for 8 weeks and is recommended for treatment in sheep 3 weeks post shearing. In individual cases, a strike may occur earlier; therefore, it is good practice to check animals regularly for blowfly strike. The product is best applied before an anticipated blowfly challenge, or when a blowfly challenge is identified on or in the vicinity of the farm. Established strikes may require a separate treatment with a knockdown insecticide. It is recommended that animals with dirty back-ends are dagged or crutched prior to application. If dagging or crutching is undertaken in the weeks following application, these animals should be re-treated, otherwise protection could be lost. Do not apply during heavy rainfall, or when such conditions are expected, as the resulting wash-out may reduce the protection period. The use of CLiKZiN has harmful effects on dung flies and beetles. Treated sheep must be kept away from watercourses for at least one hour after treatment. There is a serious risk to aquatic life if this advice is not followed.